William Hill have a promotion running over this weekend 7th – 9th October. 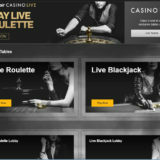 Called Fabric 4 (after their new Vegas Slot), you play on their Vegas Live Blackjack tables and you can win up to £50. Take a seat on one of the Vegas Blackjack tables between 7pm and 1am, Friday to Sunday. Seven Vegas Cards numbered one to seven will be delivered randomly to the tables 40 times per day during the Promotion Periods. There will be 120 Host visits in total during the promotional period. After Bets are placed the host will shuffle the seven cards and the dealer will pick one at random. The number of the card corresponds to a player position. If someone is sitting there they have won and will be invited to spin the Vegas Wheel. If the “0” segment is spun, player gets no prize. 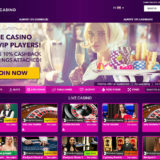 In the event of a “Bonus” segment being spun – the player will receive a cash prize of £25 and an extra spin on the wheel. The sum of both segments combined is the total amount awarded. A maximum of one extra spin is given once the “Bonus” segment has been spun. If the next spin lands on the “bonus” segment they will win £50. 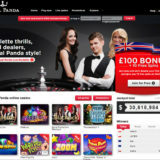 If the extra spin lands on the “0” segment, the player wins only the initial £25 cash prize. Cash prizes are non-transferable and will be credited directly into player’s accounts within 24 hours of this promotion ending. Any unused payments will be removed from the player’s account after 7 days. 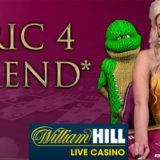 For full terms and conditions of the promotion visit William Hill.com.